সহিংস বিক্ষোভ সমাবেশের কয়েক সপ্তাহ আগে অশোকের বিরুদ্ধে অনলাইন এবং অফলাইনে বর্ণবাদী বার্তা ছড়ানো হয়েছিল। উদাহরণ হিসেবে নিচের লিফলেটের কথাই ধরা যায়। সেখানে পাঠকদের কাছে জানতে চাওয়া হয়েছে, অশোকের বিরুদ্ধে গুপ্তহত্যায় তারা সমর্থন করবে কিনা! #peaceprotest411 was an empty promise. Speeches, banners, posters filled with hate and violence are circulating. A friend's windshield was pelted by rocks because he, the driver, has slanted eyes. Glass door of a restaurant in Muara Karang also pelted by rocks. Sudah terbukti bahwa Demo hari ini bukan Demo Bela Agama. Lihat saja tuntutan para demonstran. Mereka juga ingin MELENGSERKAN JOKOWI!! The fact is that today's protest was not to defend our religion. Just listen to what they demanded. 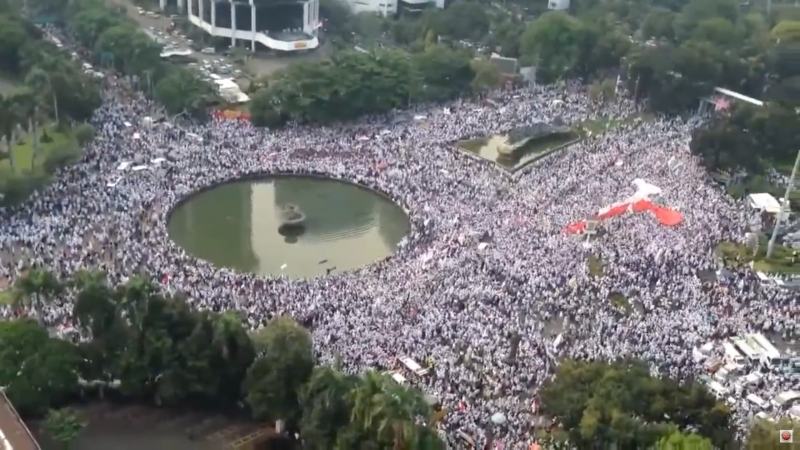 They want Jokowi to step down. Apa yang kalian lakukan sesungguhnya bukan jihad membela Islam, Al-Qur'an, apalagi membela Tuhan. Apa yang kalian lakukan sebenarnya adalah jihad membela egomu, membela kepentingan kelompokmu, membela parpolmu, membela tokoh dan idolamu, membela ormas Islammu, membela nafsu-serakah kekuasaanmu. You claimed it was a “constitutional jihad” to defend the country, but you've disgraced the nation's foundations and constitution. You ignored the legal procedures, legal manners, and processes. You claimed that it was jihad to defend Islam, yet you disgrace Islamic norms and ethics. You ignored Islamic morals and moralities. Your actions were rabid, as if possessed by evil, and your foul words are clear evidence that you weren't defending Islam. What you did was not jihad in defense of Islam, Al-Qur'an, or God. What you did was jihad to defend your ego, to defend your Islamic organization, your greed, and power-thirsty selves.